Graduating from high school or college is a big accomplishment—one you want to celebrate with your friends and family. Pongal Event Center provides the space and the services you need to put together a memorable party for your honored grad. Our guests are not restricted to in-house services, so you may choose your menu and caterer and all other service providers. We offer a number of package deals plus a number of add-ons and customization options. For details, please contact Tom, our event coordinator, or Jef our planning pro. Parents of the proud graduate may have their hands full just trying to get through the remainder of the school year. If you need some help planning your graduation party, let us help! Pongal Event Center has an event planner who has planned more than 800 events and provides as much or as little assistance as you want. 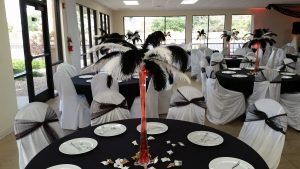 To learn more about event planning packages, please contact Elaine, our event planner. Weekends after local high school graduations fill up fast, so call us today to book your special event!